Ever since your real mom has gone, your step mother has been there for you, to take care of you, to listen to your stories, to help you with your life, to give you advices, to be a mother to you. On that reason alone, it is very important that you show her just how much you want her in your life, how grateful you are that she is there for you when you need her, to let her know that you still think of her from time to time though you may be a grown up now. Here are some birthday wishes that will surely make her happy and brighten up her mood on her special day. Thank you for tolerating all my stupidity and carelessness, always, happy birthday step mom. You are truly unbelievable, how you accepted us all in your gracious arms, you are our mom. I just want to say that you are one of the most wonderful persons that I know, we love you so! On your special day, let us do your work for you so you can have some time to just relax. Your words of advice to me are the one that I live on, those are the ones I appreciate most. Providing for me like I am your real daughter is something I am grateful to you forever for. Happy birthday step mom, you showed me just how kind and generous you are with your love. You made our home lovelier than it was before you came, thank you and may you enjoy today. This is your big day, the one when we can show you that love comes purely from our hearts. I hope that you notice that we love you so much and we cannot ever live without you, mom! No matter what other people may think or say, you are already the real mother for us all here. Happy birthday step mom, you are the most amazing one in the world, I really do love you so. What you are is an outstanding example of a mother, you are an inspiration, enjoy your birthday! You are the symbol of love and happiness for me and I will always be, have a joyful birthday! Most likely, I will never be able to repay you for all that you have given me, especially love. I will never trade you for anything in this world, thank you and have happy birthday step mom! Let me show you that a gift from heaven is what you truly are, so let me make it up to you. When you come home from work, I promise I will shower you with kisses, step mother, I will. I still thank the universe for letting you come my way, you are the best mum I can ever get. You were the rock that I held on to when the hardest times of my life came, thank you, mommy! 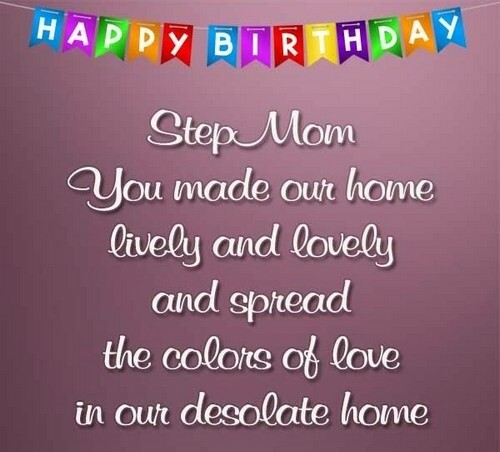 I am wishing you a good day and a joyful life full of surprises, happy birthday step mom! You have shown me nothing but kindness ever since you came into my life, thank you so much. Raising me up with a good character only proves that you are a great person, enjoy your day. You may not be my real mother but you are still the one for me, may you have fun on this day. May this day of yours bring you a lot of blessings and prosperity, happy birthday step mom! You took care of me when my own mother took me for granted and left, I really appreciate it. We may have a complicated relationship but I hope you know that the truth is I love you so. Today, I will fill you up with hugs and kisses and wishes for good health and good life, mom. Happy birthday step mom, let us celebrate your day by hanging out with each other all day. No matter what circumstance life may put us through, I promise you that I will love you, mum. Honestly, you are my role model, you are the one I look up to, you are the best one for me! 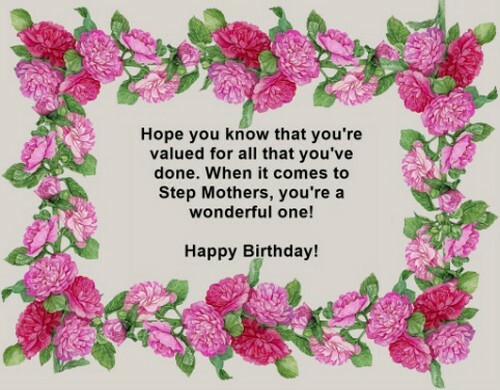 I hope that I got the gift you wanted for this special day of yours because I care a lot for you. I promise that I will take care of you as you grow older because you took care for me, mum. You may be my step mother but you are the best one of them all you have always been kind. Every step of the way you held my hand and never let it go, I will do the same for you, mum. 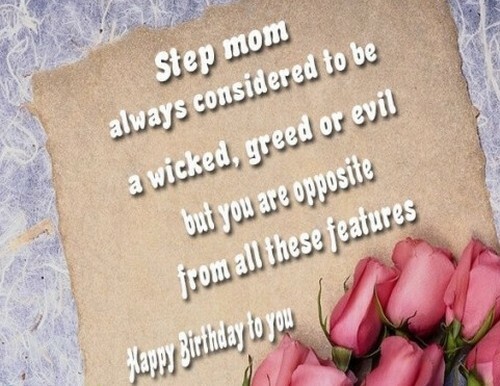 Happy birthday step mom, I have come to be so close to you because you cared for me so dear. There is hope for me when I see you and know that people find the right one for them later on. I lost my mother once but to get another one is just a miracle that I can never get over from. If there is one thing about knowing you are my mother, it is that I am filled with so much joy. 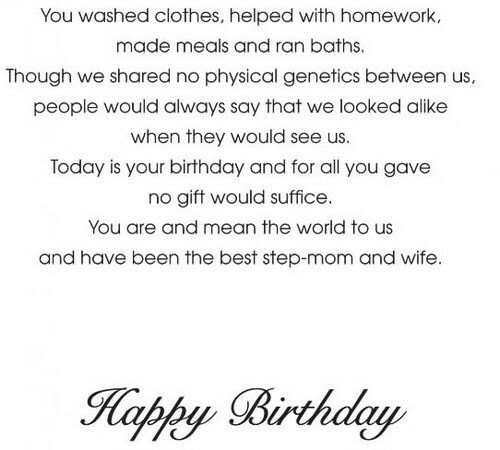 I cannot even think of a moment away from you, you are the best, happy birthday step mom! I have developed a life with you that I never thought I would, you give me courage every step. There is so much that I have that I want to show you, and I will keep doing so for you, mother. Our connection to each other is something that no one will ever take away from the two of us. 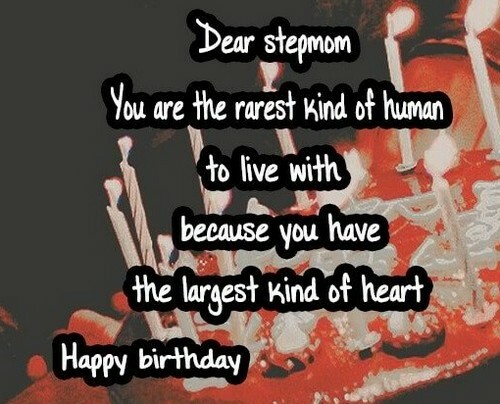 You are my only mom, never the second one, I only know you as that happy birthday step mom! I love you with all the love that I can hold in this tiny heart within, happy birthday step mom! You are one of the people who have the grace to become a real mother, thank you for that. An award is what you truly deserve because you always put us first before yourself, mother. Rationality is your forte and I thank you for teaching that to me, hope you have a blast today! You gave me more than any mother out there can give their children and I thank you for that. I may not be the best step child but I promise that I will keep trying to become worth it, mum. I used to hate you until I realized you only wanted the best for me, happy birthday step mom! Forgive me for all the times that I used to get bad on purpose because I dislike you back then. Never will I take you for granted because you have shown me what it is like to be loved, mum. This day is about you and only you so I just hope that you have a wonderful day on this birthday! Today is the day of your birth, so I promise to give you the best party there ever is in town. Happy birthday step mom, I thank God that He gave me a time with you, to be at peace at last. You love me even when I do not think I can love what I see in the mirror, it means a lot, mum. It was difficult for me to see my real mom go away but you showed me what I am missing. Mother, I still thank you that you never let my hatred for you before get between the us two. My point is you took care of me and my father and that is more than enough, step mother. Happy birthday step mom, you’re the most beautiful mom that deserves the best birthday ever! 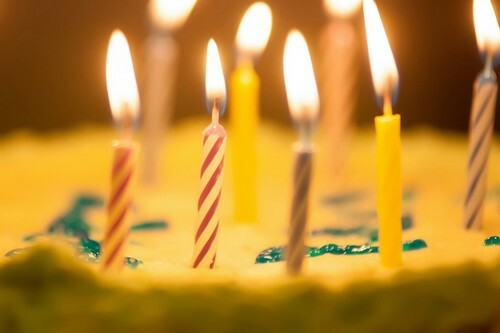 Have the happiest birthday celebration because I for one is happy that you were born here. You are the best package there is in this world, lovable, forgiving, caring and everything else. It brings me so much happiness to see that you are enjoying yourself, you deserve that, mom. Happy birthday step mom, may you enjoy everything that this day will be offering you soon. I just want to celebrate the day when you were born into this world and came into my life. Being humble and generous are just some traits that I love the most about you, step mother. I hope you stay being the person that you are, the mother that I have love for the long run. I remember every lesson that you have taught me, I appreciate them, happy birthday step mom! You care for me in unconditional ways more than my real mother did and that is proof of love. The truth is you are the one who accepted me through and through, I love you, mother, I do. You are a friend as much as you are a mother to me and for that I will offer the world for thee. 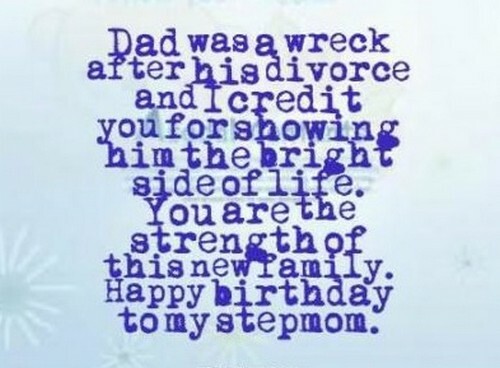 Happy birthday step mom, you never did let the world define who you are though I once did. You have always been the one to kiss me goodnight and tell me stories, and so I slept tight. For being the best mother I can ever have, I wish you to have the best birthday in this life! May you enjoy this bday of yours as you never had on those ones before, I love you so much. You make my dad happy and so do I because of you so I just wish you a happy birthday step mom! I am celebrating the birth of the woman who raised me to be who I am at this very moment. 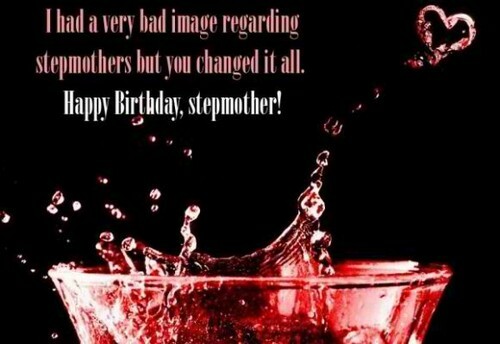 You never were evil like all those fairy tales depicted you to be, so happy birthday step mom! Happy birthday step mom, I wish that you grow older to be a whole lot wiser at life as well. You took care of me when I was a child and you still do so have a happy birthday step mom. I will never deny you of more than you deserve for you have always been the light of my life. Happy birthday step mom, you are outstanding and I love you so much, I want you to know.